I like this recipe for its simplicity, good flavor and health cooking. Poaching the fish in water reduces the calorie count significantly. Using heirloom tomatoes adds nice color. If heirloom tomatoes are not available, use ripe red tomatoes. In skillet, add ½ inch water and simmer. Add olive oil and lemon juice. 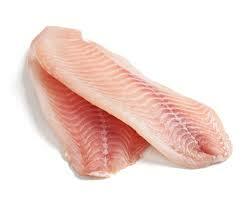 Slice fish into 1 inch slices. Gently add fish a few at a time, poaching for 2 minutes. Sprinkle with salt and pepper. Gently turn and poach the other side. Remove fish and place on towel to absorb water. Thin herb pesto with 2 TBS water. To serve: Drizzle platter with 1 TBS pesto. Arrange tomatoes on top (or you can do individual plates). Sprinkle with sea salt. Gently arrange fish on top. Drizzle on the herb pesto. 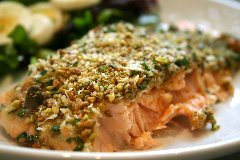 The dill and lemon combine with the pistachio crust on the salmon to provide an extra bite. Line cookie sheet with parchment paper. Spray with cooking spray. Place salmon on cookie sheet and spinkle with salt, pepper and dill. Mix together the pistachios and bread crumbs and put on top of salmon, coating thinly. Dot with butter. Sprinkle with lemon. Bake 15 - 20 minutes. Who would think that mushroom soup, olives and onion rings would form such a delectable combo? When this fish bakes, the flavors merge into moist heaven. Preheat oven to 350 ° F. Spray a cookie sheet with cooking spray. Arrange tilapia on cookie sheet. Top with cream of mushroom soup. Sprinkle with olives and onion rings. Bake 20 minutes or until fish is flaky.